Former Donald Trump campaign chairman Paul Manafort (left) listened with his lawyer Kevin Downing. ALEXANDRIA, Va. (AP) — Prosecutors were poised Friday to wrap up their case against former Trump campaign chairman Paul Manafort, but the sometimes dramatic proceedings hit some unexpected delays after court opened. Judge T.S. Ellis III called a recess without explanation after huddling with attorneys from Special Counsel Robert Mueller’s office and Manafort’s lawyers for more than 20 minutes. Later after bringing court back into session, he strongly reminded jurors that they weren’t to discuss the tax evasion and bank fraud case with anyone. It was a hiccup as prosecutors headed toward resting their case against Manafort, proceedings that have been sometimes dramatic and featured tense exchanges with Mueller’s prosecutors. Earlier Friday, the prosecutors asked Ellis III to correct an earlier statement in which the judge suggested they were wasting the court’s time. On Thursday, prosecutors questioned a loan officer for Citizen’s Bank of New York, asking about Manafort’s 2016 loan application that the bank rejected. Ellis III interjected: ‘‘You might want to spend time on a loan that was granted.’’ Prosecutors said Ellis’ crack ‘‘misrepresents the law’’ regarding bank conspiracy and ‘‘is likely to confuse the jury.’’ Ellis did not immediately comment on the motion. The developments came after weeks of testimony that was sometimes tedious and based on bank and other records. Some spectators who had waited in line to attend the proceedings were seen falling asleep during a meticulous accounting of transactions, emails and ledgers that form the foundation of the case against Manafort. President Donald Trump’s campaign manager was a longtime political operator in Washington and elsewhere, right up to 2016 when the real estate magnate him as his campaign chairman. The prosecution is Mueller’s first of the investigation into Russian meddling in the presidential election, but neither Manafort nor his former protege Rick Gates has been charged in connection with their Trump campaign work. Though substantive, untelevised and far from a Trump-style reality show, the trial has featured some drama when star witness Gates testified against his former boss. Gates said he helped Manafort commit crimes in an effort to protect Manafort’s finances. Defense attorneys called Gates a liar interested in avoiding jail time under a plea deal. Gates was forced to admit embezzling hundreds of thousands of dollars from Manafort and an extramarital affair. When the two were first brought face-to-face in the courtroom, Manafort’s gaze bore down on his former protege and rarely wandered. Testimony was replete with examples of Manafort’s lavish lifestyle and allegedly falsified documents, including loan applications. ‘‘Remember, he believes that you and Jessica are living there,’’ Manafort wrote in the email, referencing his daughter. 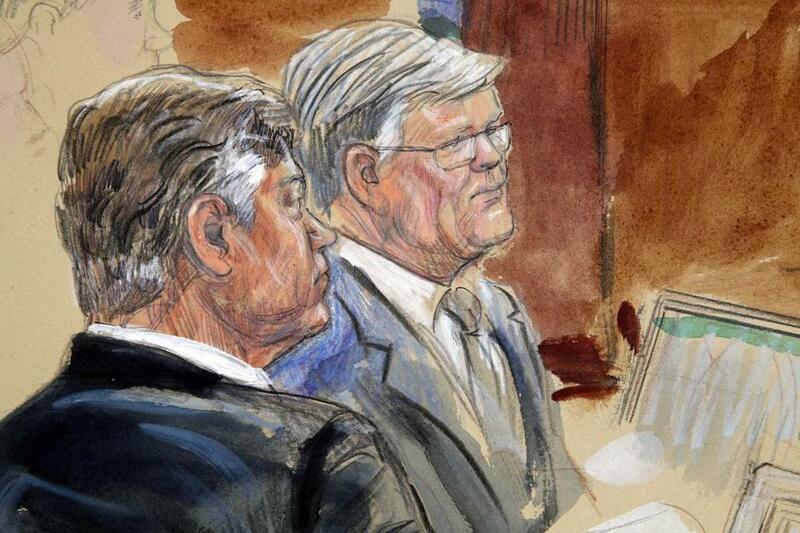 The prosecution has called more than 20 witnesses, including Gates, and introduced a trove of documentary evidence as they’ve sought to prove Manafort defrauded banks and concealed millions of dollars in offshore bank accounts from the IRS. Along the way, they’ve not only faced an aggressive defense team but tongue-lashings, and a rare walk-back, from Ellis. The judge has subjected the prosecution to repeated scolding over the pace of their questioning, their large amount of trial exhibits and even their facial expressions. But on Thursday, Ellis told jurors he went overboard when he erupted at prosecutors a day earlier for allowing an expert witness to remain in the courtroom during the trial.